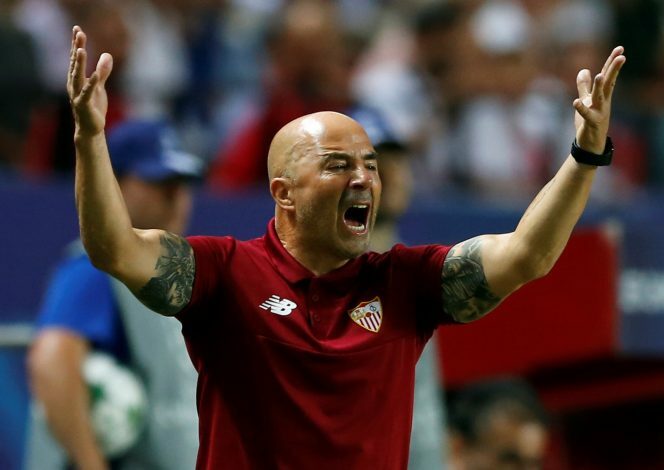 Barcelona are interested in hiring Jorge Sampaoli as Luis Enrique’s successor if the Asturian coach does not sign a contract extension at Sevilla. Luis Enrique joined Barcelona in 2014, and led the team to a treble and a double in consecutive seasons. Understandably, the club would love to hand him a contract extension. But it is understood that ‘Lucho’ doesn’t want to talk about it until the end of the season – when his current contract will run out. In such a situation, Barca are naturally looking for a replacement, and one name high on the list is Jorge Sampaoli. The former Chile manager is now managing Sevilla, and he has done considerably well so far, with his team sitting second in the La Liga table, ahead of Barcelona. Sampaoli has often confessed to being a fan of Barcelona’s style of play. He especially admires former manager Guardiola, and the high pressing, high possession game that he preached. Sevilla also follow a similar style now. Jurgen Klopp was also linked with the Catalan club recently. The German also encourages a similar style of football, albeit with even more intense pressing. The results have been positive at Borussia Dortmund and Liverpool. But Sampaoli might hold the edge, with his success with the Chile national team. He ended their long wait for a major trophy by guiding them to a Copa America victory in 2015. Another huge plus for Sampaoli might be Messi. The star forward is reportedly a big fan of the Argentine, and this might have a huge influence on the Barca administration. Sevilla have progressed to the last 16 of the Champions League under him, and have an outside shot for the league title. However, despite his immediate success at the Ramon Sanchez-Pizjuan, he is open to a move to Barcelona in the summer should the chance arise.